It’s hard to believe it was 13 years ago back in a cold December on the little island of Guernsey when I decided to start blogging. I’d had a static site with a few odd musings on it since 2000 but this was to be conversational, regularly updated and with more technical content. Blogspot seemed the easiest way to get started. Within 18 months of regular blogging I’d moved over to Subtext which being a .NET app required Windows hosting so threw it on a small Shuttle PC on my home DSL. This is where I started using it as an experiment for CSS and web techniques but within a year I’d had my 1MB DSL brought to it’s knees twice through articles being featured on Boing Boing. I did however contribute a little to the project and started chatting with the maintainer - Phil Haack - who I’d end up meeting when we both joined Microsoft years later and is a friend to this day. In 2007 I migrated to a PHP based CMS that was making a name for itself called WordPress. My blog would remain on WordPress for 10 years across shared hosting, VMs and dedicated servers. One server was caught in an explosion at the ISP, another time my site got pwned through a WordPress vulnerability. I switched themes several times before creating my own super-light MootStrap theme based around the BootStrap 2 layout and nav bar. I messed with wp-SuperCache trying to improve performance and scalability before switching out the PHP engine for HHVM as well as using NGINX instead of Apache and MariaDB instead of MySQL all in an attempt to eek out a bit of extra performance. While my theme lives on today - for now at least - MootStrap and PHP are no more as I switched over to the Jekyll static site generator earlier this month after a long meandering journey to get there. The price aspect is definitely worth mentioning again. With the occasional bursts in traffic my site hosting generally worked out around $40 a month for a decent VM. On AWS I’m expecting it to max out at $3 despite these improvements and benefits. Of course part of the other reason is static site generators are interesting and I like to play. I’ve been trying to get my content out of Subtext and into WordPress – a process that shouldn’t be difficult however Subtext only supports the blog-independent BlogML format and whilst WordPress supports a number of import formats BlogML isn’t one of them. For export WordPress only supports it’s own WordPress WXR format although the BlogML guys have an exporter available. The first idea was to put together an XSL transform to convert BlogML to WXR. 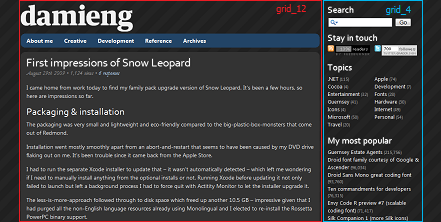 BlogML posts look like this although Subtext fails to populate the views attribute or even a tag for the user-email as at 1.9.3. It also doesn’t include a field for a commenter’s IP addresses. These two limitations mean no Gravatars or Identicons at the other end right now. <post id="1" date-created="2006-04-24T04:07:00" date-modified="2006-04-25T11:55:00" approved="true"
WXR posts are extended RSS items and annoyingly doesn’t have a field for view counts at all. Link and guid tags are populated but WordPress seems to ignore them. Will investigate soon! Time-zone conversion does not take place – hand-code +offsets in the XSLT to deal with your zone. Default namespace in BlogML is not handled – remove the xmlns=”…” declaration from your BlogML file before transforming. HTML within comments is not supported – when I enabled this WordPress treated the HTML as text. Embedded attachments are not supported. Edit the primary site link at channel/link in the transformed file to match your site – BlogML doesn’t include it. Multiple authors and categories should work just fine so throw this file and your BlogML export through an XSLT processor and presto, WXR content ready for import. My favorite .NET blogging system, Subtext, is celebrating it’s first .NET 2.0 compatible release known as Subtext 1.9. Haack and the team have worked hard on getting it out so here’s a thanks to them. I’ve deployed it here with only a couple of minor issues which are most likely due to me previously running a self-modified version off the Subversion trunk. As a result it didn’t quite detect that it needed to upgrade the database nor that my skin was missing and it should use something else for now. If anyone else has the same problem simply remove the 1.9.0 record from your subversion_version table and it should upgrade the tables and stored procedures appropriately. Now you can modify, run, debug and test safely on your dev machine until you are happy it’s ready for live. To deploy to live either build in Release mode or right-click on Subtext.Web.csproj_deploy and choose build. You can also have the deployment project replace sections of the web.config on the target machine – useful when your live server connects to a different database for example.